Hobie are renowned for innovation and doing things differently – their Mirage Eclipse pretty much proves that (search for it online if you’re not aware). 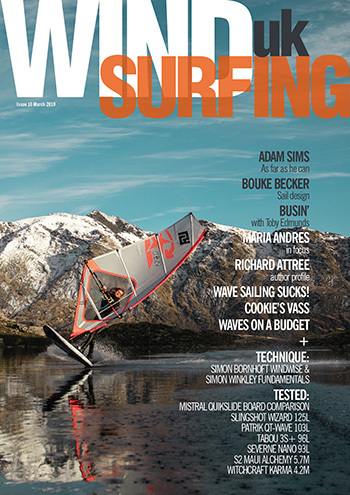 In the UK there are a few fans but Hobie have yet to make a serious dent in the SUP market. That could all be about to change, however. We were passed two inflatable products to review. 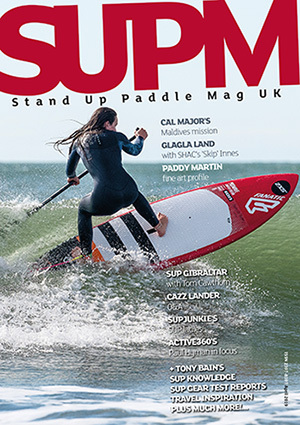 The 12.6ft Tour, tested here, and the 10.2ft Coaster that’ll appear in October’s edition of SUP Mag UK. Straight out of the box and the first thing that strikes you about the 12.6ft Tour are the two raised foot pads located up front underneath the main deck grip. More on these in a sec. Manufactured from Hi-Tech Dropstitch the Tour is one of the easiest boards we’ve used to inflate. So easy, in fact, that you can blow up to its recommended 15 PSI using just one hand – all with a single chamber pump. Its supplied bag is a nice design – extremely practical and robust. There’s plenty of room inside for all your gear and the ‘top hatch’ opening style makes it no hassle to get your board in and out. The supplied fin does the job, securing with a push lock system. Scattered about the deck you’ll find an assortment of D-rings for attaching essentials while on the nose is the obligatory bungee cord which can be used to lash gear to the deck. A padded webbing strap style carry handle completes the look. At 32” wide Hobie’s Tour 12.6ft is stable. It’s a pretty rigid platform which the 5.75” thickness helps with. There’s a degree of nose rocker that allows paddlers to climb wavelets and bumps with ease and manoeuvres, such as pivot turns, are rewarding with a wide tail helping keep riders moisture free. Onto those foot pads and they really do make a difference. All our testers remarked on them and how they’re (surprisingly) located in the correct paddling position. We say surprisingly as different height/weight/builds can affect where you stand (slightly) on any given board. What was really noticeable, however, was how the pads removed a large chunk of what you feel when paddling an iSUP. By this we mean the reverberations you get through it being an air filled platform. This ‘feel’ can take a bit of getting used to. With the Hobie Tour paddlers will find it less of an odd sensation simply climbing aboard and just getting going. By placebo it means the Tour is perceived to be more stable than it actually is and therefore inspires confidence. 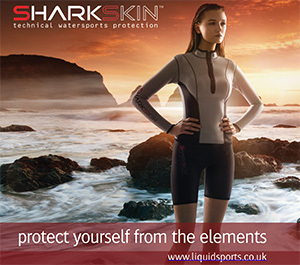 Rough waters are now less challenging for intermediates while comfort levels are through the roof. Hobie’s Tour 12.6ft is an efficient inflatable touring SUP that does everything you’d expect a stable pointy nose board to do. It cuts a nice track through the brine and offers an efficient tutoring platform for progression. Stability is good and the Tour can be laden with all manner of paraphernalia. Embedded in the deck are a pair of foot pads which lend a feeling of even more stability by helping to remove some of the sensation of being atop an air filled board. This should be embraced as the pads do an admirable job of mimicking a hard SUP. Super easy to inflate and good fun Hobie’s Tour 12.6ft inflatable would be a worthy inclusion to most paddler’s quivers.